As I was cooking this Chili, I began reminiscing back to the first walk-through of our house. I remember the realtor showing us around and explaining that although there are not records dating back that far, he believed the house to have been built sometime around 1870. I took one look around and knew he wasn’t kidding. The floors were unlevel, the drywall was made of plaster, and the glass in the windows appeared to be as thin as tissue paper. I could feel the draft through the absence of insulation in the exterior walls. The air smelled stale and the floorboards creaked beneath our feet. The realtor lead us up the steep narrow staircase to view the upstairs. That is when I fell in love with it. The fireplace. I was instantly captured by its old world charm. It was brick-red and beautiful. I realized it was actually not one, but four fireplaces, all connected to a single chimney, with a two-sided fireplace downstairs, one side in the living room and the other in the study. Then, upstairs there was a fireplace in each of the bedrooms. While standing in the little back bedroom, I said to Jimmy “Awww it’s so cute. When I look at this fireplace I envision a little boy, back in the old days, waking up in the middle of he night, stoking his fire to keep warm.” Jimmy rolled his eyes and replied sarcastically, “Really? When I look at this fireplace I envision a panicked mother using it to heat water because the little boy is dying of influenza.” He HATES when I find antiques charming. Actually, he despises antiques altogether (probably because, in reality, they really are just old, used, obsolete objects that serve no purpose other than as decorations to make a home look old, used, and obsolete. But, I will never admit that to him!! ;) Anyway, while my heart was easily stolen by the fireplace, his was easily stolen by the riverfront acreage. Warm cozy fires danced in my head…. boats and quads ripped around in his. With little hesitation, we decided to purchase the house. A few months and a lot of handy work later, we turned the house into our home. Eventually, we added this white porcelain Jotul woodstove to one of the downstairs fireplaces. 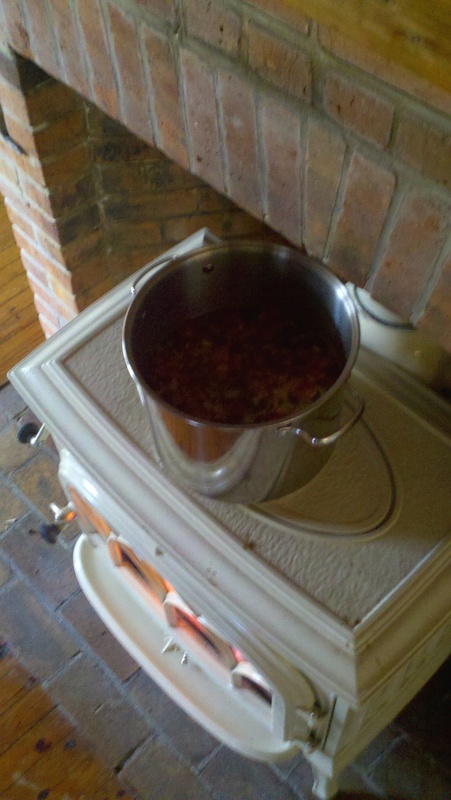 Today, I am using it as a heat source to simmer this White Chicken Chili, nineteen century style. Place chicken breasts in a covered frying pan and cook over medium/low heat for about 30 minutes, until chicken is cooked through. Remove chicken and use two forks to shred apart into bitesize pieces. In a large stockpot combine chicken stock, shredded chicken, peppers, onion, jalapeno, cilantro, garlic, and seasonings. Bring to a boil, then reduce heat, add cream and let simmer for about an hour or 2. Add beans. Use cornstarch to thicken sauce if desired. Serve topped with shredded cheese, sour cream, and/or tortilla chips.